Intergenerational Dance Class- all are welcome! Come dance with us in a community of movers of all ages! Camp Third Act is a new signature program to help you contemplate the “third act” of your life. Christina Soriano taught a movement class at the weekend event which included presentations from other Wake Forest leaders, time for reflection, interactive sessions with follow-up discussions, all designed to help you define your calling and build a roadmap for what’s next. Following on from the successful Aging Re-Imagined 1.5 in the Spring of 2017 Aging Re-Imagined 2.0 was a successful continuation of the conversation about aging. This is place to come & learn with others about different aspects of aging with artists, clinicians, community members & researchers. Click right to see photos from the event. The first annual fun and inspiring fundraising walk event that unites families, friends and communities both large and small in the fight against Parkinson’s disease. 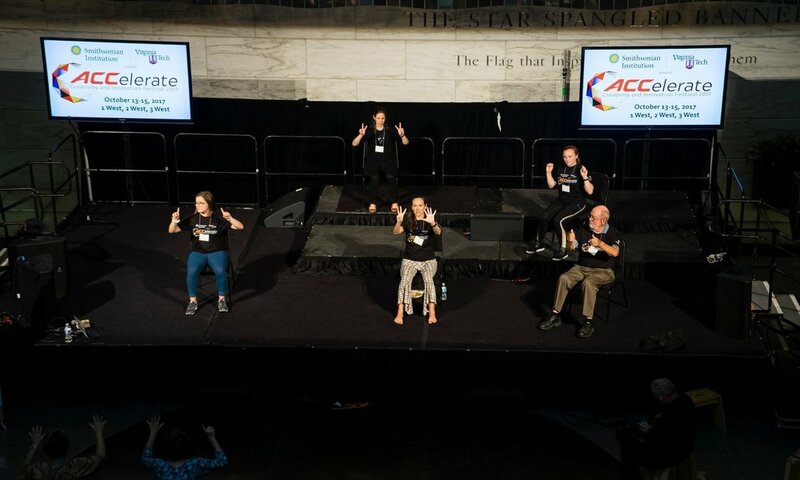 This celebration of movement featured a family friendly walk course, a kids area, a caregivers relaxation tent and a special Movement Pavilion featuring improvisational dance with Christina Soriano used to help manage the symptoms of PD. Soriano leading movement with Parkinson's patients and their care partners. The TEDxWakeForestU community seeks to extend the TED experience at a regional level, highlighting exceptional people and creative works, connecting people across disciplines, creating conversations that drive action. CHRISTINA SORIANO & CHRISTINA HUGENSCHMIDT, PHD did a talk about their NIH-funded randomized clinical trial, testing Soriano's improvisational dance method in a community of adults living with Mild Cognitive Impairment and their carepartners. IMPROVment class at ACCelerate Festival. Photos by Ginny Weiler- click right to scroll below.